I had the opportunity recently to walk over a pedestrian overpass. 3 feet thick and 12 feet wide, concrete and steel suspended over a sea of automobiles traveling 80+ miles per hour. The overpass was suspended about 20 feet over the Eight lane highway as I made my way across. It’s exhilarating and a really neat perspective that you don’t normally get on cars. I could not stop myself from feeling a little anxious. As I stood on the overpass trying to identify my angst, I realized that my logical brain and my primitive brain were fighting each other. Logically I was surrounded in a fenced in cage. You can not jump out. You can not fall out. The concrete is not going to collapse. The walkway had survived many years and even many earthquakes. I was safe. My primitive brain on the other hand was freaking out. “There are cars coming right at you!”, my reptile brain stated urgently. “They look like they are going really fast!”, it insisted. “Could we just speed up a bit and get to the other side?”, it began to plead. “Why the hell are you just standing there?”, my reptile brain implored. It is interesting, that after all these years of evolution our primary instincts are pretty locked in. They haven’t really been able to make the shift into our modern life. As recently as 100 years ago this experience would have been unusual, or even impossible, cars were just starting to become common. So on one level, it is crucial that I allow for grace when relating to these parts of my brain. I can realize that I’m dealing with outdated software and expired survival mechanisms. Beyond grace, I can even step into gratitude. That part of my brain is simply trying to keep me alive. While it missed the nuance of my surroundings it has clearly identified a potential threat and it is just looking out for me. This is one of those awareness moments that helps us to process emotions and instinct. It is useful to realize why your body is having a panic reaction when you are simply trying to take a walk in the modern world. We live in a world that is frequently perceived by our primitive minds as threatening. The world has changed too fast to expect these instincts, that are potentially millions of years old, to adapt. These every day experiences can lead us to stress and anxiety that we are not even aware of on a conscious level. But the subconscious concerns raised by our primitive mind are very real and our body reacts in a very real way. Over time it takes a toll on us mentally and physically. This is why it has become crucial for us to remember to take down time. This is why we need moments in silence away from the threats of the newly developing world. Your reptile brain has no clue what to do with a pedestrian overpass, or a Facebook news feed, or a glowing display that you hold in front of your eyes for 10 hours a day to keep on top of your email. This is why your body keeps telling you to take a break. 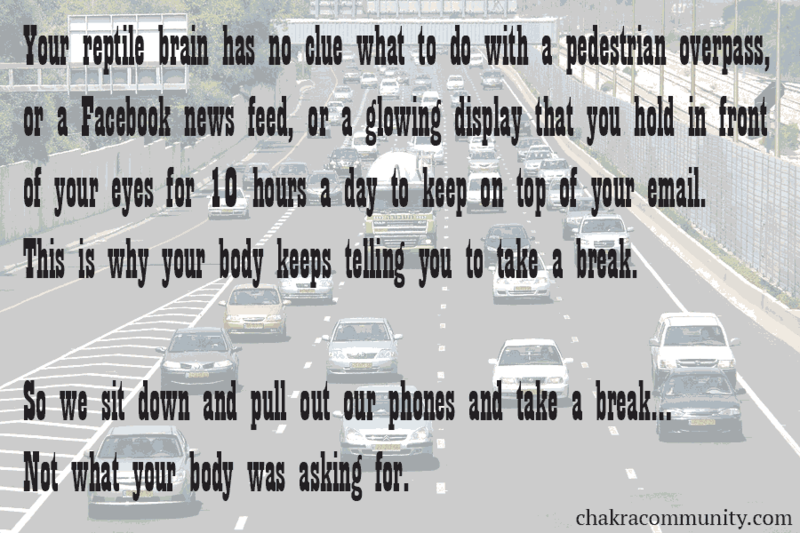 So we sit down and pull out our phones and take a break… Not what your body was asking for. Since our minds won’t be able to evolve and adapt to the world we’ve brought them into, perhaps we need to evolve our patterns and habits to take into account what our primitive brain needs. You’ll be glad you did. After all, you are really just doing yourself a favor. Now turn off your phone and go play in the grass.